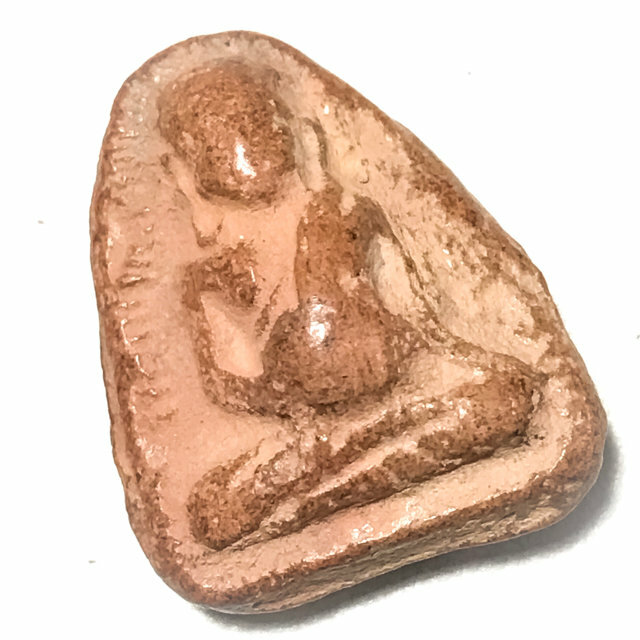 A rare amulet of the great Luang Por Guay of Wat Kositaram, which was blessed and released in 2515 BE at Wat Nong Iduk. The amulet is made from Nuea Din Pasom Pong Wan, and was one of a large number of amulets made by Luang Por Guay from Muan Sarn Sacred Powders and Baked Earthen Clay, to help the temple of Wat Nong Iduk. Luang Por Guay was the main patron of this temple, and he was always very concerned to help the temple of Wat Nong Iduk. And so, in 2515 BE, he commissioned Ajarn Pai, who was an expert artisan renowned for his block press designs for pressing beautiful amulets, to make a series of different designs to donate to the temple of Wat Nong Iduk. Luang Por Guay took these amulets to the temple and they were blessed there, for distribution to raise funds to develop the temple. The abbot of Wat Nong Iduk , Luang Por Phaew, had also invited some other masters to join Luang Por Guay in the empowerments and the chanting of the Buddha Abhiseka Blessing Ceremony, including many famous Isan masters of the time, and the great Luang Por Ruesi Ling Dam, of Wat Ta Sung. A rare chance for a rare amulet for true Devotees of Luang Por Guay, for Bucha, and blessings of Maha Lap, Metta Mahaniyom, Maha Pokasap, and Serm Duang. Pra Sangkajjai is one of the most popular amulets for Powerful Maha Lap, Metta Maha Niyom, Maha Pokasap and Maha Sanaeh Power. Pra Sangkajjai represents one of the Pra Sidtisawok Aedtakka (One of the Buddha’s the most admired and praised practitioners). The Buddha praised him for his ability to put long complex teachings into short understandable formulas. He has a golden tinted skin complexion, and was originally so similar in appearance and stature to the Lord Buddha, that sometimes people would mistake him for the Buddha if seen from a distance. For this reason, he used his mind powers to force his body to grow fatter and not so handsome as before, in order to not confuse others if he was the Buddha or not. The ancient masters would often use the visual symbolism of Pra Sangkajjai’s features to create statues in this image, which has served as an important preserver of the Faith over the Centuries, and a very old form of Buddha image dating back to the early times of Buddhism. His amulets are now extremely rare to find because those who already own any will never wish to part with them again, and they are hence becoming one of the rarest kind of amulets to find these days. Usuallly this happens because of specualtion by the collector scene, but in the case of Luang Por Guay's amulets, it has happened primarily for their Sacred Value, much much more than for their collectorship and artistic value, which is of course also extremely high. Luang Por Guay is famous for his immensely diligent and complex manner of empowering (Pluk Sek) amulets, which involved daily empowerments at various times of day namely at dawn, morning, midday, afternoon, evening and midnight. In addition, he would perform empowerments during the various 'Reuks' (Astrological Influential moments), to bring total coverage of protection and fortuitous blessings to all who might wear and Bucha his amulets. Luang Por Guay was born on 2nd of November 2448 in the year of the snake. Luang Por Guay was already was already able to read the Dhammapada and Pali Prayers long before he ordained at the age of seven, having learned from Luang Por Khuad. Luang Por Guay was Ordained on the 5th of June 2467 at 15:17 pm. He was aged 20 years old. Luang Por Guay was famous for his Mastery of many different Wicha, including the Wicha of Tattooing Sak Yant. Every single edition of amulets he ever made are now rare classics and highly revered for their Magical Power. On the 1st September 2491, Luang Por Guay was elected Abbot of Wat Ban Kae. Luang Por Guay saw that the folk of Ban Kae were very poor and many people did not have enough to eat, and thus took up the practice of only eating one meal a day instead of the two before midday which are normally allowed for a Maha Nikaya Buddhist monk, in support of the people and to consume less. He would help the poor and needy and heal the sick, give Buddha amulets to those who needed some confidence and something to help them fight on in life, and try his best to improve the life of local Folk in general. He was very loved for this by the local Folk. Luang Por was not a monk who liked to build things or develop, he liked simplicity and stillness. Even his Kuti was old ‘Song Thai’ (Thai style wooden house), that he had given the temple lay committee and some Looksit the task of building it to save money, and only hired special craftsmen for the most difficult pieces of the building. The temple thus only had old rickety Kuti huts and no fancy buildings except for the Uposadha shrine room, the Kuti Chudtintaro (memorial Kuti hut for LP Guay), and the Sala Tam Bun building. Luang Por Guay passed away, on the 12 April 2522 at the age of 75 years old. He passed on in peaceful recline. But when Luang Por returned to the temple, he continued his habit of eating only one meal a day without paying attention to the warnings. It seemed that since his return from hospital though, that his casting of magic spells and empowerment of amulets had become even more effervescent and intense. He seemed very strong physically as far as outside appearances went. In the year 2522, Luang Por wrote down two notes in his calendar; Pra Luang Por Guay marked the day he would become ill with blue pen, and the day he died was marked in red pen. The days were the 11th March, and the 11th April 2522 BE. Luang Por had written the Pra Kata Namo Dta Bord, and the words “I Pra Guay Na Dtandto Namo Dtandti Dtandti Dtandto Namo Dtan Dtan – will die on the 11th April at 7:55”. As the 11th came nearer, Luang Por Guay fell ill, but it was not possible to detect any fever or recognizable illness – he could not eat, and would even spit his rice out and refuse any more, instead grabbing a piece of Tkgrut Foil, and inscribing spells. In the night he would hold the Sai Sincana cord and empower amulets. He would inscribe lottery numbers on the palm of his hand, and sometimes show to Looksit with Choke Lap who came to pay last respects. The temple bell fell down from where it was hanging, and crashed to the floor ringing out loud with a resounding echo. The Looksit then realised that Luang Por Guay had passed on in this moment, and tuned to look at the time. It was exactly 7:55 am on the 12th April. Arahandti Gajjaayana Thaero Mahaa Poko Pawandtumae. This Kata calls luck and fortune and brings wealth, and other great treasures. Chanting this Kata is Good for increasing popularity, business sales and promoted status. In addition, Sangkajjai amulets have the special abstract magical quality of increasing your common sense, mindfulness and wisdom is also present within this amulet. This particular aspect of the Sangkajjai magic is what is called a ‘Prisnatam’ (mysterious phenomenon).